Systems Connection will install and reconfigure new and existing furniture systems, including panel systems, case goods and floor to ceiling wall systems. Our installers participate in factory training and are certified in multiple major furniture lines. Systems Connection will safely and professionally transport your furniture assets using our full fleet of vans, trucks and tractor trailers. Systems Connection, when required, also partners with professional moving contractors for larger moves. Systems Connection has and will engage in long term “Furniture Service Contracts”, tailored to your business or agency’s specific requirements. Systems Connection has and will contract with furniture dealers and manufacturers to do warranty and maintenance work. 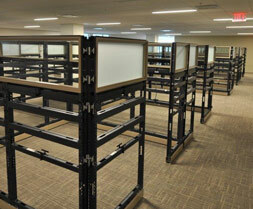 We are “Certified and/or Factory Trained in multiple major manufacturers furniture systems. Systems Connection will receive and redeliver your furniture through our professionally staffed warehouse. Deliveries are inspected for damages/deficiencies, and dealer/manufacturer is notified upon receipt. We can also provide furniture repair or touch-up service, before final delivery, if necessary. Systems Connection has the capability to provide storage, short or long term, in our climate controlled warehouses. Systems Connection recycles all metal, wood and cardboard. We will dispose of customers furniture assets using the latest Greening Procedures, or assist in liquidation of furniture assets by partnering with brokers.